It has been almost one month since my last blog post. Last Friday, I had surgery and the last month has been a literal countdown. There was so much to arrange between my work life and home life that, at times, it was overwhelming. I had client work to clear off my desk, my other work commitments needed to be satisfied and I had to prepare myself and my house for the long recuperation period. When the decision was made to do surgery, I promised myself that I was going to embrace it all. I decided that my surgery was a new beginning for me. This surgery was the last step in a 16 year saga of multiple procedures and surgeries, of not feeling well and of having to accept my body’s inabilities. Throughout this time, there have been many difficult moments of sadness, depression, anger and frustration. Luckily, it also brought strength, courage, acceptance and faith. While this was not the path I had chosen, I am happy with how this journey has changed me. I learned to be more compassionate. I affirmed that this faith I say I have really exists. I found out that when handed huge disappointment, I could accept it and not let it overshadow everything and make me bitter. I learned I was stronger than I ever knew. I am embracing my recuperation and using the time to do the things I feel I never have enough time for: knitting, reading and relaxing . I am back at it with my knitting so I will have updates on my current WIPs. Remember this? 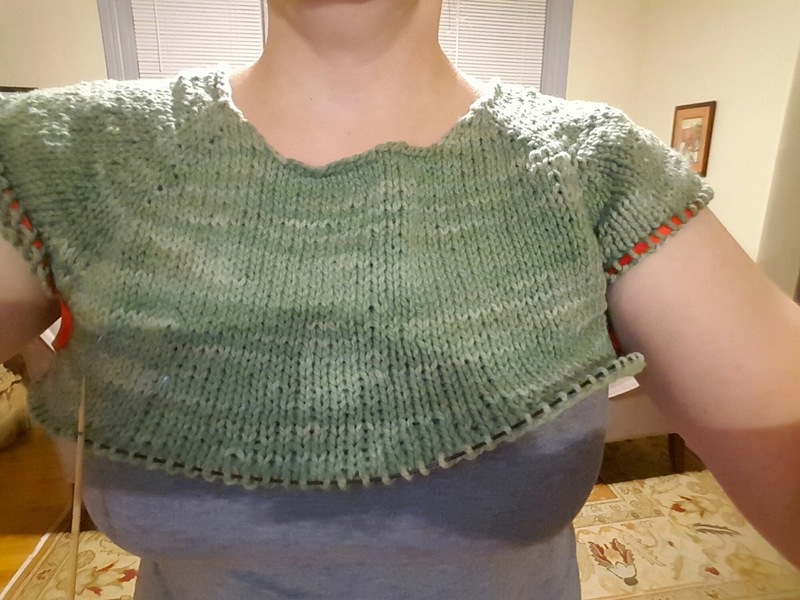 My Top Down KAL Sweater. A little something for my Auntie B! Happy to be clicking away! I became aware of Slow Fashion October at the very end of the month of October, last year. It was around then that I started following the Fringe Association blog regularly. It really got me thinking about what “slow fashion” means to me. What I realized was the way I live my life embodies the “slow” movement. This is no accident. It is how I was raised. Growing up, my siblings and I were lucky enough to have grandparents in our young lives every day. My paternal grandparents were immigrants to this country from Yugoslavia. They suffered many hardships during World War II and came here to have freedom and a better life. My maternal grandparents lived through the Great Depression. They also knew hardship and sacrifice. My paternal grandparents came to America in the 1950s. They started a Serbian restaurant at an age most people would be thinking about retirement. I watched my Baba Milunka cook. There were no microwaves. Everything was cooked slow and low to extract all of the flavor from the ingredients. She also used every little bit of everything. Nothing ever went to waste. This is the basis for how I cook: fresh ingredients, slow and low, thoughtful meal planning to make the most of my ingredients and eating local and what is in season. I have never owned a microwave. I cook and bake most everything from scratch. 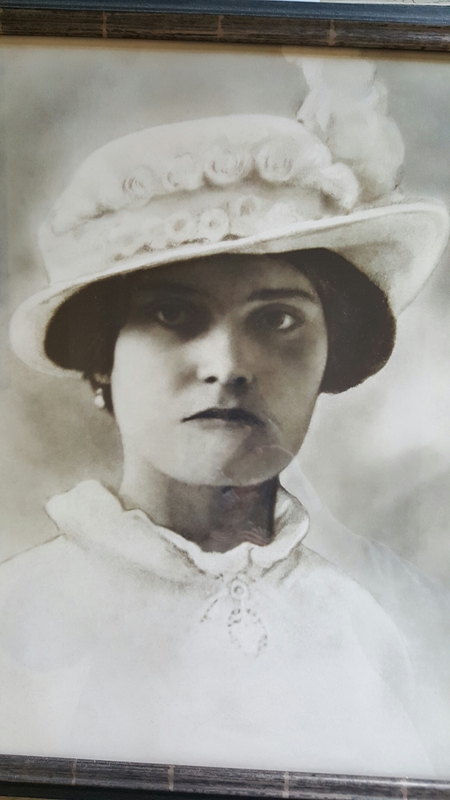 My maternal grandparents were equally influential in the way they chose to live their lives. There was no extravagance to their lifestyle. Yet, they took pleasure in the simple things in life. Both my grandparents worked. Grammy Isabelle was a working mother, at a time when this was the exception, rather than the rule. Both my grandmothers had busy lives. Yet, they were makers. 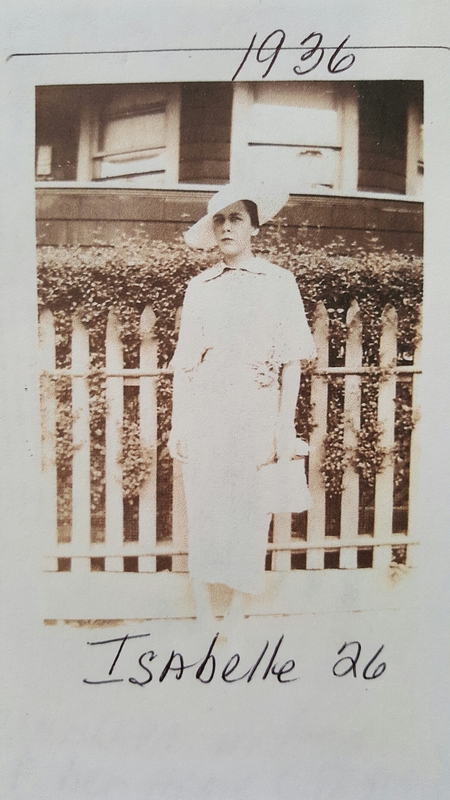 My Baba sewed her own clothes and mended everybody else’s in the family. She taught me to knit, at the kitchen table, at the restaurant. My Grammy crocheted and embroidered. One summer, she and Pop Pop drove out for a long visit. 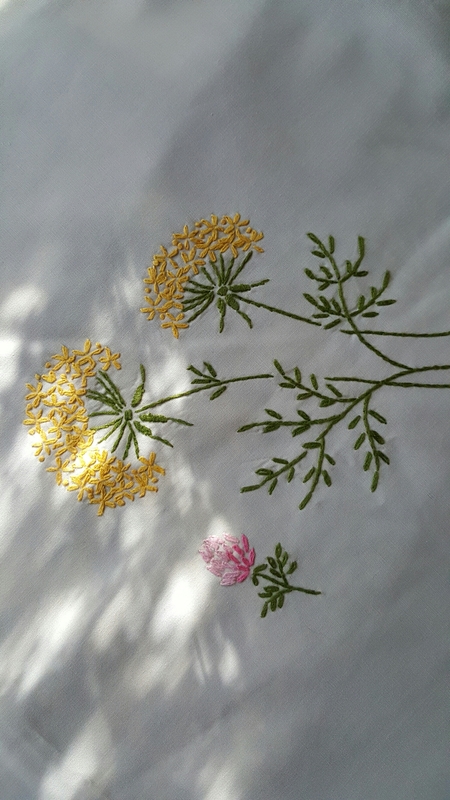 It was that trip where I sat in the backyard and learned to embroider. The tablecloth I made with my Grammy. We have gone from preserving, maintaining and repairing things to being a throw-away society. Everything is fast and really, not fast enough. We have become wasteful. In our need for fast everything, we have sacrificed quality and durability. Fast fashion is one result. Clothes are churned out of poor materials, that over time, do not wear well. This constant need for more things, the “new” look has cost us. To meet our demand, factories employ people, mostly women and children, who work in deplorable conditions for unbelievably low wages. 1. I have to absolutely love it to buy it. 2. I look for quality materials and well-made pieces. 3. I invest in timeless, classic designs. 4. If I can’t find what I want, can I make it? It has made getting dressed a pleasure. I love my clothes. Each season, I rediscover the pieces in my wardrobe. It is the same comfortable feeling you get when you are among old friends. Going back to my maker roots, has been the most rewarding. There is the obvious joy and pride that comes from making something. My desire for made things has pushed me to learn new skills. Every time I tackle a daunting project, I develop more confidence. The best part, through, is I feel connected to my grandmothers. My hands are making the same movements their’s did. I am feeling the yarn, thread and cloth just like they did. It brings me a sense of wholeness. It is home. I have been fighting off a bug since Thursday. The silver lining is I made serious progress on my top down sweater. This happened because of all of the inspiration I took from the judges and many others in the #fringeandfriendskal2016 who inspired me to #ripforjoy. 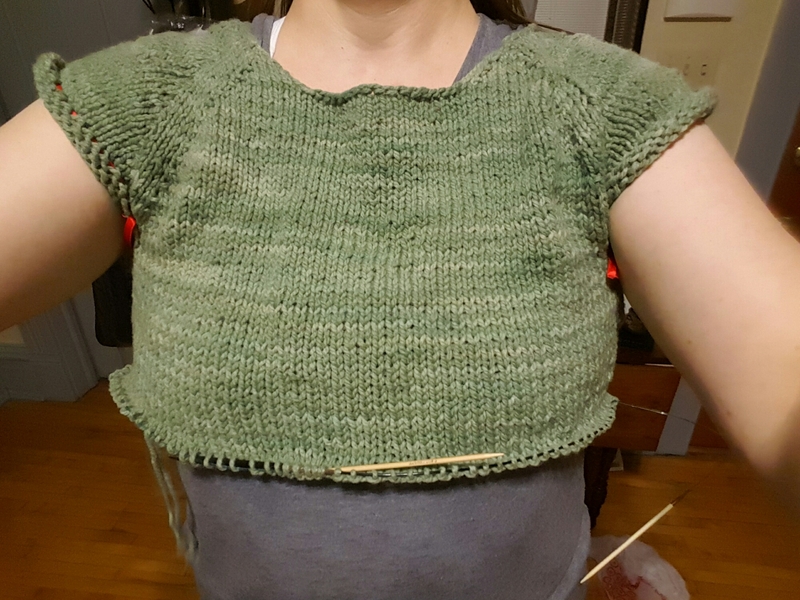 My Top Down KAL Sweater 1.0 was wonky. It puckered in multiple places and the fit was off. 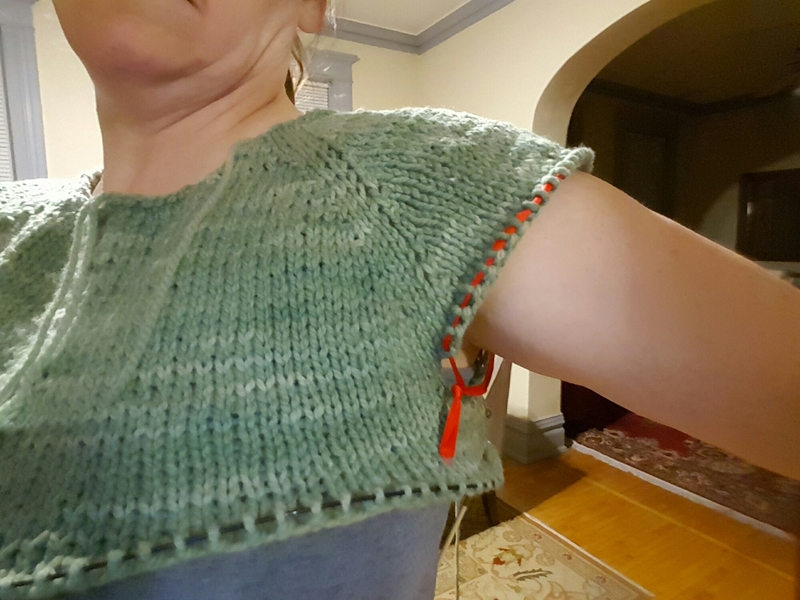 My feeling was I should have separated my sleeves earlier in my yoke. 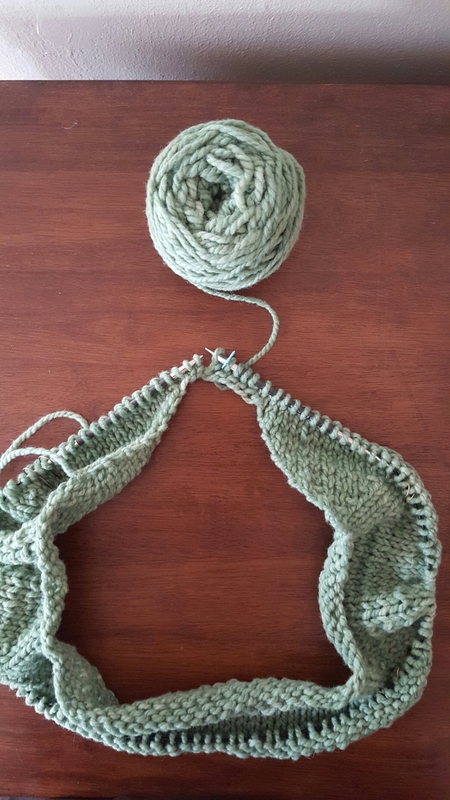 Yesterday, I started back in on my sweater. 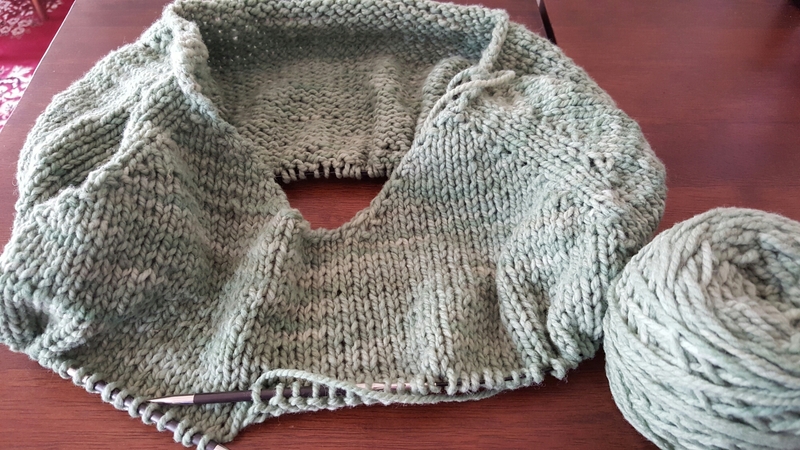 Before I began knitting, I recalculated my sweater math. This time, I remeasured my bust, higher up, at my underarms. 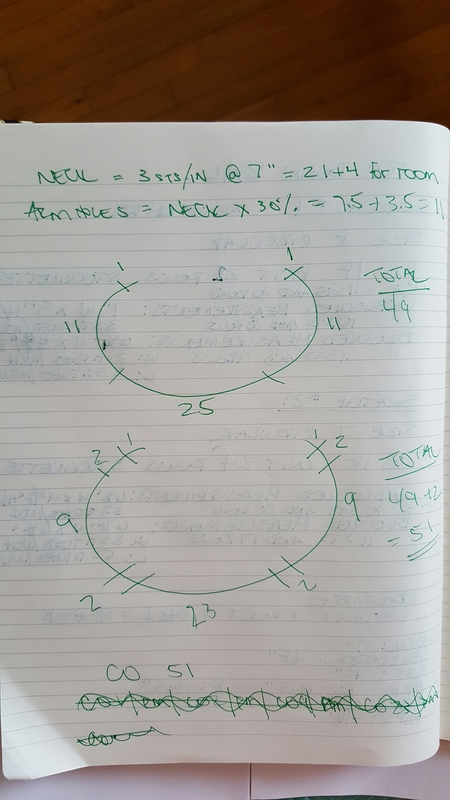 This new measurement is what I decided to use to calculate my raglan increases and my yoke depth to the separation of the sleeves from the body. I verified my pattern notes back to the Top Down Tutorial. Karen Templer provided great advice regarding the number of underarm stitches I cast on. She suggested 6 or 7 and in my first sweater, I had cast on 12. Karen even wrote a blog post on Underarms in response to the issues some of us were having. Once I cast on my sleeve stitches, I increased my bust to my full bust measurement. Look at the difference! I am so excited! The fit is so much better. The sleeves are perfect! Sorry the photos aren’t the best but I really couldn’t contain my excitement. 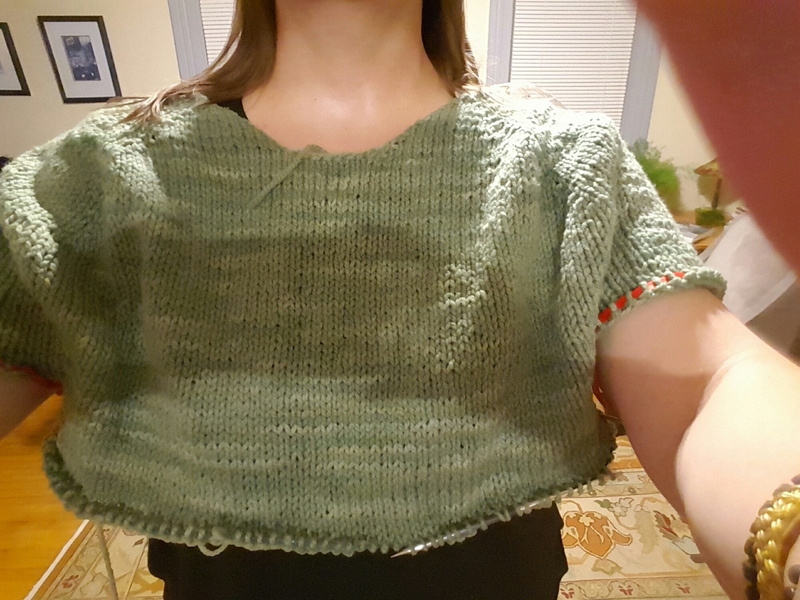 I had two goals for this KAL: to learn how to custom-fit a knitted garment and to learn how to make a top-down sweater. It all seemed so daunting at first. The process outlined in the Top Down Tutorial is an excellent guide. Measuring, trying on, measuring again, trying on again, ripping and repeating are key. I learned how knitted fabric lays, I got a better understanding of my body and I learned how to construct a sweater based on measuring and math. As I have said before, this is my first KAL. It has been a wonderful experience. Seeing all of the different sweaters being made by so many talented knitters has been inspirational. 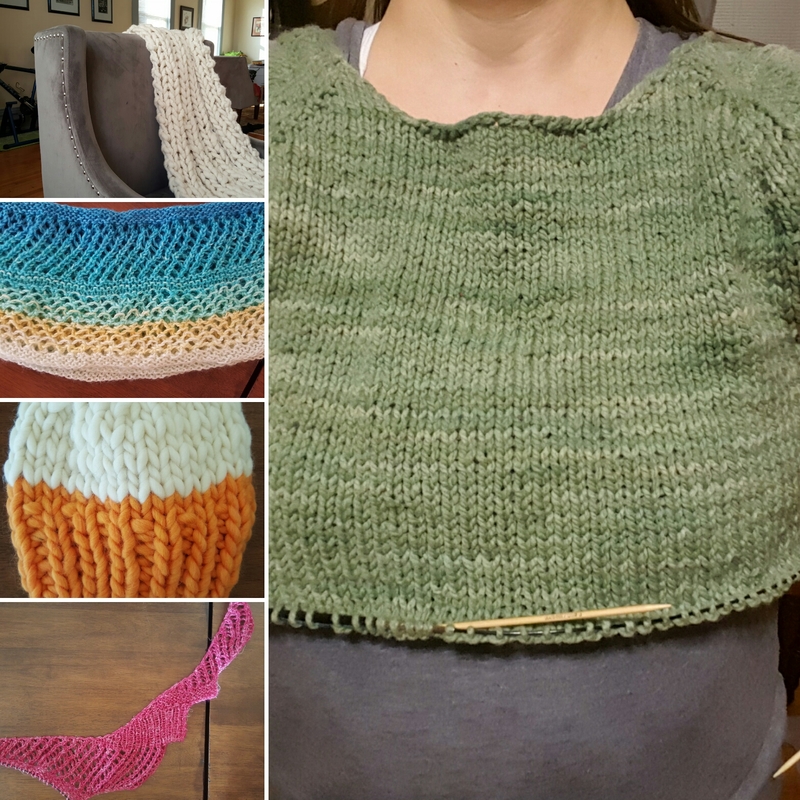 There was comfort in knowing other knitters were struggling with my same issues. It was fun to see them figure out what worked and the joy they felt when they succeeded. I am grateful for all of the support from Karen Templer, the knitters and from Kate, at Wild Haven Fiber Company. It really wasn’t a hard decision to make. My sweater fit okay in the beginning stages but as I increased to my bust measurement, the fit was much larger than I wanted. I cast on too many underarm stitches so my sleeves puckered. Basically, the fit was all wrong. So, back to the drawing board. I have recalculated my sweater math and made adjustments to my assumptions regarding size. Tomorrow morning I will cast on for #fringeandfriendskal2016 take two. My two doctor’s appointments, on Friday, proved fruitful. I thought I would have an hour to knit and instead, I had over two hours. My test was done in 20 minutes and the doctor was running late from surgery. I ended up getting almost half the length of my yoke knit. I had another doctor’s appointment on Monday and a trip to O’Hare to pick up my Mom on Tuesday. More waiting equals more knitting. In my twenties, all this waiting would have made me insane. I have learned to embrace that life doesn’t always go smoothly. Instead of getting upset, I think of it as down time provided courtesy of the Universe. Given my work schedule, I am grateful for every bit of “me” time and welcome a chance to knit or read. I managed to get my yoke knit to the point of separating my sleeves by Friday. 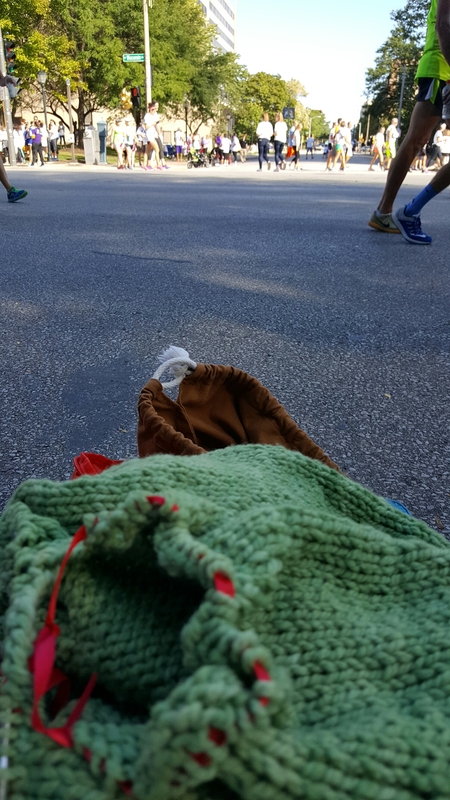 Early Sunday morning, I got my sleeves separated off and on waste ribbon so I would be able to knit while waiting for the Brigg’s & Al’s Run & Walk for Children’s Hospital of Wisconsin to start. Once, I got knitting I really didn’t want to stop so I knit the whole 3 miles of the walk. Today, I did more sweater math to determine how many decreases I wanted for my waist shaping. The goal being to knit while watching the Packer game. At halftime, I decided to try my sweater on again, since I now have sleeves. The Top Down Sweater Tutorial has been a real learning process. I have had successes and missteps along the way. I knit too many rows before I did the math for my yoke length. So that got ripped back 8 rows. 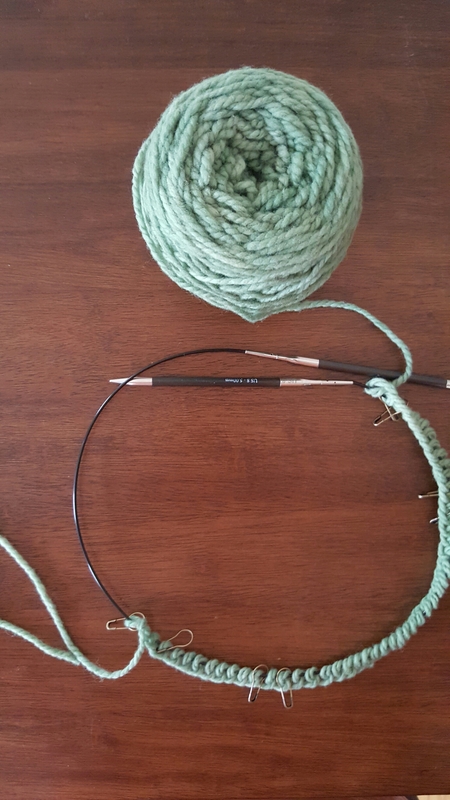 On Monday, I picked up some double pointed needles from Cream City Yarn for my sleeves. The lovely ladies suggested that I knit the sleeves on two circulars. In trying to determine what would be best, I went out to the car to bring in my knitting. I had already decided that I would deviate from my sweater math and stop adding to the depth of my yoke. Thanks to Kristine, I avoided another mistake. She told me I needed more yoke depth to ensure I would have a proper fitting sleeve and underarm. I am so grateful to them for all of their help! I learned a very important lesson – follow the tutorial and stick to the sweater math. I am concerned my sweater may be a bit too big since my shoulders are puckering. I am hoping this will resolve itself when I start knitting my sleeves. If it doesn’t, I will be ripping back most of my sweater so I can get it right. As frustrating as it will be to rip it back, I want my sweater to be exactly what I want. Fingers crossed. 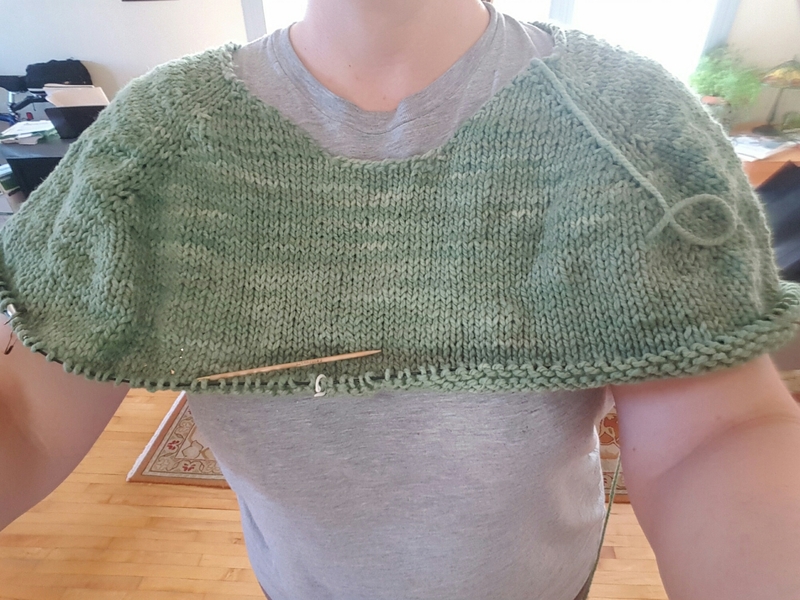 My first ever KAL is exceeding my expectations. 😍 The sheer amount of learning is incredible! The Top-Down Sweater Tutorial is terrific. It is well written and provides a thorough explanation of the process. I have been busier than normal but I am still finding time to knit. I began working on my neck. I decided to do a shaped neck, where the back of the sits higher than the front. I worked back and forth until I reached my desired depth. I then cast on 7 stitches on the front, to equal the same number of stitches as the back, and joined my neck. The next step was increases. I worked my increases every other row until my sleeves and front & back equaled my measurements, plus a little ease. Now, I am knitting my yoke to the proper length. This means I will need 45 rows of knitting. At this point, I have knit 22 rounds to get my sleeve and front & back increases from my join. This means 23 more rounds of knitting to go before I split my sleeves. I have two doctor’s appointments today with an hour between them so my needles will be clicking along. 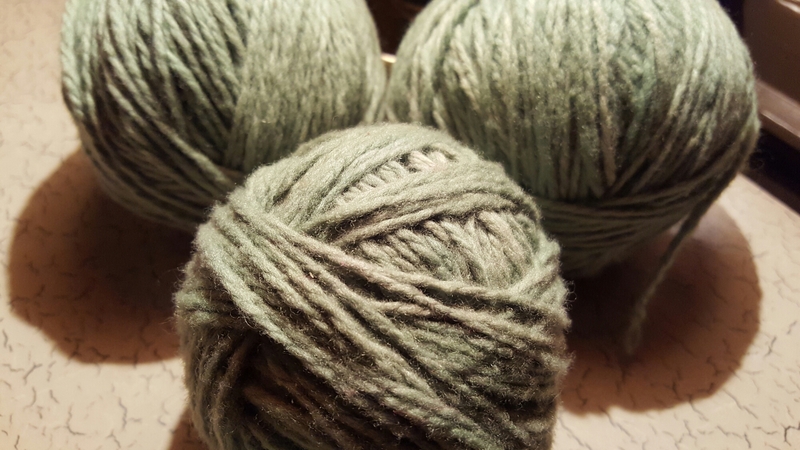 The beginning of my process was to figure out how much yarn I needed. Karen Templer’s Top Down Tutorial mentioned using Stashbot (An app available for ios. They are working on an Android version) or to find a pattern you like. I used the Ladies Classic Raglan Pullover by Jane Richmond. This was one of the patterns recommended in the tutorial. For my bust size, it recommended 1338 yards. I ordered 10 skeins (Each skein of the Cestari 100% Fine Merino is 175 yards.). I figured the leftover yarn could be a hat or mitts. 1. I think the swatched fabric looks better on the size 8 needle. There is a little bit better stitch definition. The size 7 stitches look just a bit squished together. 2. After looking at the swatches, I decided to see what needle size was recommended for my yarn. It turned out to be size 8. My first decision was to choose a reversible (No difference in front and back of sweater.) Or shaped sweater (Discernable back and front i.e. the front of the neck sits lower than the back.) I opted for a shaped sweater. I cast on my stitches based on my neck measurement, which was 7 inches. My size 8 swatch produced 3.25 stitches per inch by 5 rows per inch. I decided to build in a little ease so I added on a few stitches to get to 25 ((7 x 3)+ 4). 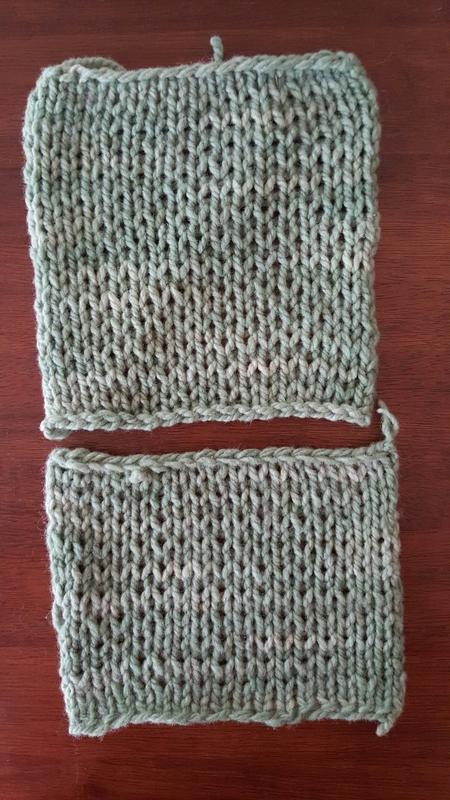 From there, the Tutorial said to cast on 30% of the neck stitches for each sleeve (25 x 30%), which yielded 7.5 and I decided to add 3.5 to add ease so I settled on 11. I need to account for 1 stitch on each side for the neck. 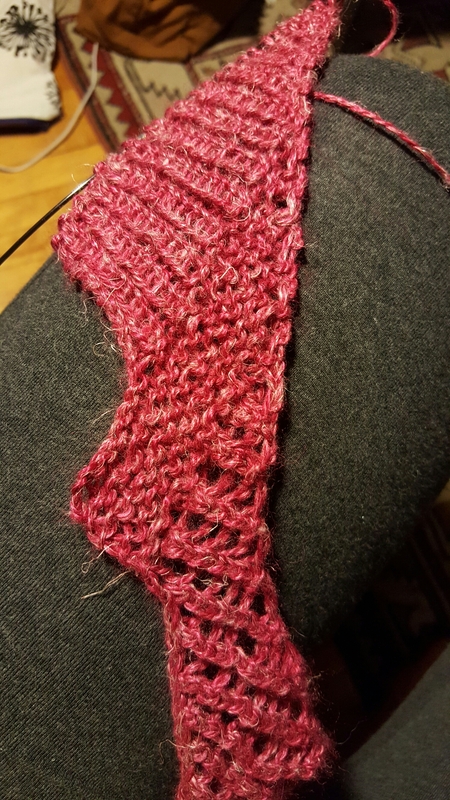 My total to cast on is 49 and I added 2 more stitches to build a little ease in. Then I decided I wanted seaming in my sweater so I need 2 stitches per raglan seam (2 x 4) for each shoulder. All that means is a reshuffling of where you place your stitch markers. As a CPA, I am used to having a “check figure,” so out of curiosity, I checked to see how close my number of cast-on stitches were to the Classic Raglan Pullover. The pattern recommend 52 stitches. This process is terrific and I am learning so much…and I have only cast on. Now, it is time to get to work knitting.